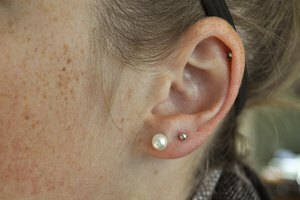 Piercings of the body are done for a variety of reasons. From fashion and eroticism to religion and social identification, naval piercings continue to be a mark of expression for millions of people around the world. Many factors can determine how quickly a naval ring closes. Common cleaning techniques are available to slow, if not eliminate, the infection and rejection of the jewelry. Bellybutton rings date back to ancient Egyptian and Latin American civilizations (they were generally associated more strongly with warriors than laymen). Worn mostly as a symbol of status rather than as an adornment or cultural marking, naval rings were earned in battle, service or leadership. Egyptian law restricted naval rings to the Pharaohs; anyone in violation of this law would be murdered on sight. Bellybutton rings were not popularized in the United States until the 1980's. The standard gauge for a bellybutton ring is 14, but a smaller or larger gauge can be requested before the piercing is made. The piercing can be stretched to later accommodate a difference in size should the standard 14 gauge be replaced with a larger gauge ring. If a smaller ring is put in place, the piercing will fit loosely until the pierced skin shrinks to accommodate the new ring. It is recommended that the original naval ring remain in the naval for 6 to 8 months before it is removed to reduce the risk of infection, scarring and to encourage proper healing. Damage to sensitive tissues around the naval area may occur even if the ring is changed by a professional. If scarring or infection does occur, the body may reject the jewelry as it attempts to ward off its "invader." To pierce the naval, a long thin rod (needle) with a sharp point is pushed through the naval. As the rod create and then passes through the two puncture holes (an exit and an entrance point) a ring is then pushed through the openings. This procedure can cause scarring and infection if done improperly or if the body immediately rejects the ring as an intruder. To reject the ring from the body, several key symptoms will occur at the puncture point and around the naval. These symptoms include crust formations around the piercing, redness, irritation, mild pain and a yellow creamy discharge. Beyond the normal scarring and infection that occur during a piercing, the body can reject the ring for any number of other factors. In some cases, it will simply attack the ring as an intruder and work to impel it, seeing it only as a foreign object. This process can last from several weeks to several months, depending on the person. Clean the piercing twice daily with a solution of warm sea salt and water. Mix the solution and apply liberally to the area, cleaning the ring as well as the naval area. Allow it to air dry. If slight irritation occurs, see a doctor. Never put alcohol or Neosporin or any other type of medicine on the jewelry, as these can greatly increase the rate of infection or cause severe irritation. If properly cared for and cleaned daily, a belly button ring can last a lifetime. The key is to maintain the jewelry as you would any other: Clean daily, never touch with dirty hands, avoid pulling, see a doctor for regular checks, wait 6 to 8 months before changing the original piercing, and above all, never attempt to stretch the piercing yourself. Always see a professional piercer about making any changes or adjustment to the piercing or jewelry.